Over the past year, I’ve posted some notes and stories on Facebook that I’d like to save. Since I now have a blog, I decided to save those stories on here so I have them all in one place. 1) Today (March 10) is my mom’s birthday. And I’m pretty sure there is no one she loves more than her 5 (+1 on the way +2 in Heaven) grandkids. Except maybe my dad. But grandkids are a close second. Closer on some days than others… am I right, dad? All kidding aside, mom always loves a good grandkid story, and this story is about 3 of them. So, happy birthday, mom! 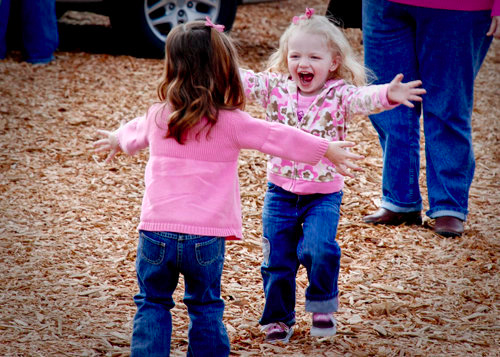 2) Annalise has really been missing her cousin Ellia lately. Just this morning, she was carrying around pictures of her and talking about when she’ll get to finally see her again. We really miss that girl. So so bad. And her mommy and daddy and sister. We are hoping to get to see them soon. And when we do, there will undoubtedly be stories of antics from FOUR hilarious kids – 5 if my other sis and fam get to visit, too. Until then, most of the stories will be of our two. But that’s okay, because even on sad-and-missing-my-sisters days, these two bring joy in a thousand different ways. Jacob has a giant blue blow-up bat that is as tall as Leesie. (No, I would not purchase such a ridiculously tempting sister-beating tool for him, but a nice boy gave it to him at the Raspberry Festival after Jacob tried to steal it about a dozen times. Thank you, “nice” boy.) Anyway, it is the only thing in the house that is the exact same height as Annalise, it is easily transportable, and it is the perfect squeezable toy for ginormous hugs from a girl of the same height. 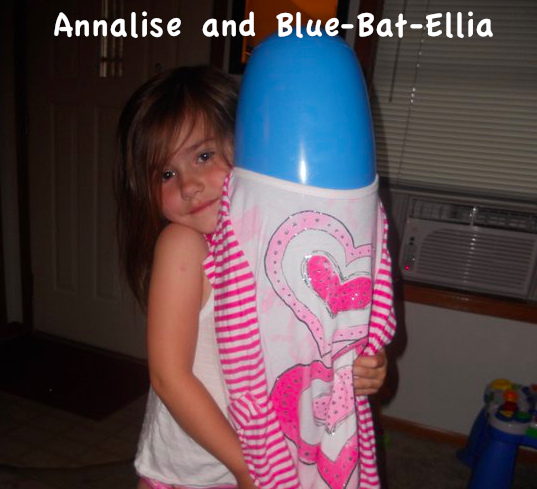 So, naturally, Annalise took possession of the bat and named it “Ellia.” The real Ellia is Annalise’s same-age cousin who is a missionary kid living in Indonesia. Blue-bat Ellia has replaced Pretend Ellia. Finally, Ellia exists in a physical form… just one of a giant blow-up bat. But it has also been a problem. Mainly because Jacob also knows exactly where Ellia is now, too. 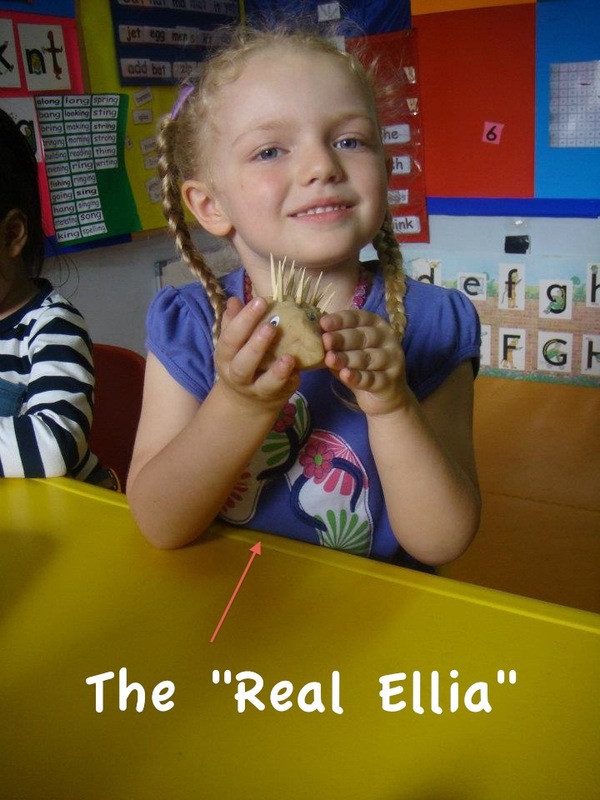 Sometimes, Jacob gets a hold of “Ellia” and beats people with it… I mean her. Or, he whacks the end of the bat on the ground. Both generate blood-curdling screams from his older sister about him hurting Ellia’s head. Never mind my head. Or arm. Or whatever it is Jacob can reach at the moment with the 3+ foot tall bat. 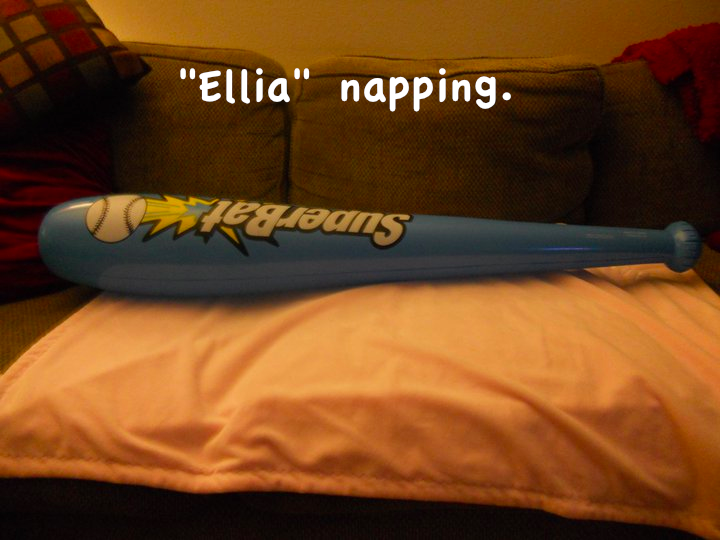 But the biggest problem with inflatable Ellia is not that Jacob can run off with her, tormenting his big sister. No, I’m certain the biggest problem is yet to come. At the moment, Annalise spends nearly all her waking hours at home telling Ellia what to do. And at the moment, “Ellia” is nothing but compliant. “Ellia, you sit here. I will sit here.” Ellia does. “Ellia, lay down and take a nap.” Ellia does. And for as long as Annalise desires. “Ellia, you sleep on the bottom bunk, I’ll sleep on the top, okay?” No arguments from Ellia. Not even about the choice of blanket or pillow. I’m just so curious how this meeting will go, when both strong little girls at last get to be together to play – with a playmate who has her own strong opinions. Not to mention, there will be two (three, counting Riley!) younger siblings together to torment their older siblings as a team. And from what I know of Jacob and what I’ve heard about mischievous Alyssa, I’m thinking the combination of Jacob+Alyssa will be more than 1+1=2. Whatever happens, I am so looking forward to the time when we can all be together and cousins can play and make memories like the ones I have of growing up with my own cousins. They are some of my greatest memories. Although a giant bat may not argue much, real cousins definitely have more interesting things to say, and you don’t have to carry them everywhere you want them to go. But most importantly, they can return ginormous hugs with their own arms. That is a moment I dream of for both my kids, and for me. Auntie Holly loves you so much, real-Ellia. And your mommy, daddy, and sister too! But here’s the thing. They are MY parents. And the “funny” things I write are about THEIR grandchildren. This equates to high entertainment value for THEM, which in their mind – equates to good book material. The problem is, life stories about an average mom/teacher and her silly kids/husband aren’t high-sell value to the rest of the public, as in, those not related to us. It’s kinda akin to those American Idol try-outs where the singers are convinced they are the best because their family told them so. And then they are completely shocked and devastated when Simon laughs them off the stage. (Is it Simon now? I can’t remember.) And we all “get to” watch the embarrassing fiasco from our EZ chairs. Well, my parents always taught me “Just because so-and-so says to jump off a cliff, would you?” In this case, my parents are the so-and-so. And no, I will not. Because I have no desire to spend countless hours writing a book (about I don’t know what) that will only be mocked by countless Simons (publishers). So I am writing a blog instead. That way, my parents can read my “published” work and be happy. And if you are one of the 3 friends of mine/my parents who also said I should write a book, you can read it, too. And for those who don’t care if I write a book but would like to keep up on the on-goings of the Priestmans, you can read it too. And if you don’t care about knowing about the Priestmans, well, you should. Because we’re kinda a fun bunch. At least I think so. And ALL of you can still laugh from your EZ chairs. Hopefully it will just be more laughing with than at. Oh yeah, and please read the “Finding Our Joy” in the top right corner. It is the real reason I am writing this. So we can remember to look for the joy and to share that joy with others.